Disappointingly, the creative world is often rife with theft and misattribution. Forgery has always been a part of the art world, as it is in an situation where there is a lot of money to be made, but one of the largest and longest running frauds in the art world is the saga of Margaret Keane and her ex-husband Walter. While Walter is now deceased, the saga is only finally coming to light thanks to an upcoming movie by renowned director Tim Burton starring Amy Adams and Christoph Waltz. 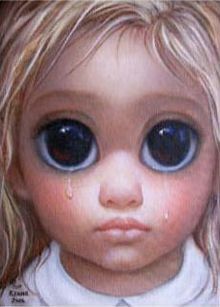 That, however, was the last truthful thing about Walter Keane's career. Back in the United States, he began selling portraits of children featuring incredibly huge and expressive eyes, supposedly inspired by his time in Europe. He began to amass quite a large following, and as it often does, with fame came money, and by the 1960s, he was a rich man. The only problem was that he wasn't actually responsible for any of the works - they were all painted by his wife Margaret. Walter was apparently quite the charmer, but as in most abusive relationships, he was only charming when it suited him. He even went so far as to completely fabricate conversations and interactions in his 1983 memoir titled The World of Keane in order to prop up his status as the true artist. However, it would eventually all come crumbling down. By the mid 1980s, Margaret had divorced Walter and filed a lawsuit against him for a share of the work. In order to prove her authorship of all the paintings, the judge had each party paint a portrait in the courtroom, which Margaret finished in under an hour - while Walter claimed he had a sore arm and couldn't paint. Naturally, Margaret won her lawsuit and was awarded $4 million USD in damages (only a fraction of what she should have earned from her work), but she never saw a penny of the money as Walter had blown it all by then. The only saving grace from this terrible saga of heartbreak and theft is that at last the whole story is coming out - and Margaret is a part of it.